The secret behind low calorie yam noodles is konjac. 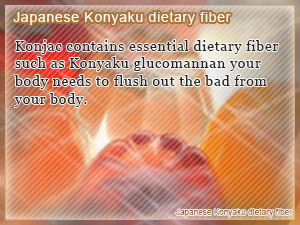 Japanese-Konyaku give you konjac glucomannan and dietary fiber to make your diet work out for the best. Konjac ("Konyaku") is one of the important pillars of the Japanese Diet that always seems to get showed by Miso-Soup and other great Health Foods making their way out of Japan. What most people don't know is the true identity of what is the Konyaku Diet. Is konjac root good for helping me my weight loss? Konjac is an ally to anyone wishing to lose weight just by changing the way you eat. The secret to making your diet work may be to simply start adding konjac to your daily meals. Diets that use this root bring a lot to the table when it comes to helping you succeed in weight loss the right way, eating right and exercising. Japanese-Konyaku makes an excellent calorie controlling agent that expands quickly in your stomach after consumption holding down your appetite not to mention gives you the dietary fiber you need to rid your body of constipation, improve your intestinal environment making it harder to gain weight. In this daily Slism, we will go head on into the Konyaku diet taking on konjac glucomannan for weight loss as well as simply ways you can get more konjac root based food in your diet along with benefits and areas to be concerned about. All you need to start on the Japanese Konyaku Diet is to simply add Konjac based foods such as Shirataki Noodle made popular by Miracle Noodles in the United States or even consider taking Konjac Glucomannan as a weight loss supplement. Either way, you don't want to miss out on what eating Konjac can do for your diet. Not only is konjac low-caloriesomething that you don't want to forget about the next time you're thinking about going on a calorie cutting binge. Dishes that use konjac foods such as Japanese-Shirataki make a great reduced calorie alternative to other topping that you can mix other foods such as rice. Using konjac in preparing desert is a definite possibility that would be a waste without exploring for your own experience. The number of ways you can use konjac to make ramen, pasta, and even jelly! Be on the lookout for new ways to eat konjac. After eating konjac the dietary fibers soak up digestive fluids in your stomach serving as a natural way to kill hunger, suppressing your hunger so that you can get full eating less. However, in order for this to work, hydrating your body is key. Never forget to drink enough water while dieting on konjac. One reason why many not willing to bite down for their diet step away from dieting with konjac is the smell of calcium hydroxide left behind from the process used to actually make konjac into the ashy tofu-like substance you are able to buy at the store. Although it is not short to say that the smell of konjac is distinct. Luckily enough there is a way out that is steam after applying salt removing loose moisture. Note it may be possible to buy konjac with scent removed. This approach makes a great time-saver when you are in a rush. What makes konjac so special as a food to aid in weight loss are the calories in konjac. With only 15 calories per serving (1 slice - 300g) there is no reason you should be feeling guilty after eating konjac. Eating Japanese Konyaku is not only guilt-free but brings Essential Nutrition to the table. Not only is konjac a great source of dietary fiber, ceramide, and calcium, it has anti-aging polyphenols and other antioxidant to keep you looking young maintaining your weight. Konjac is rich in a dietary fiber called glucomannan that you may have heard about browsing through catalogs of great dietary supplements. Glucomannan like other dietary fiber is not only great for helping alleviate constipation related issues flushing out harmful toxins easily left behind in your intestinal tract, but also helps out with gut flora probiotics, decreasing the bad bacterial in your intestines in effect increase the good bacteria count left behind. The probiotic effect of Konjac Glucomannan gives your body the little extra it needs to make maintaining weight easier and even lose a few pounds in the process. When your mother told you to chew your food she was right. There are many benefits of chewing your food in your diet that go way beyond drastically improving the safety of your meals, most notably being able get full eating less. Being able to eat konjac with ease is an acquired ability. Due to the fact that konjac is probably the toughest jelly looking food that you are going to want to eat, it makes you put your face muscles to work chewing. Chewing you food helps hold down your appetite greatly reducing the probability of overeating, essential for healthy weight maintenance. Calcium in konjac helps ease irritation related issues in your diet calming your body to chill your mind. Combining guilt free konjac and stress eliminating calcium makes an excellent combination and just what you need to get over the humps. 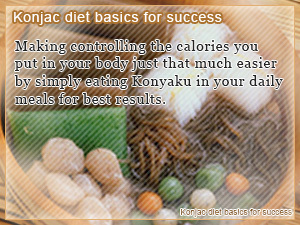 Although konjac is a low calorie food that that doesn't mean that you can eat as much as you want. In fact, there are limits to what would be considered overeating that you should keep in mind when dieting on konjac. First and probably the most important thing that you should hope to get away with is that the Konyaku Diet doesn't mean that you are stuck eating Konjac until you lose weight and move on with your life. No! The konjac diet is a tool that if done right broadens the meaning of cutting calories. Like any other successful diet the principle remains that you must make up in areas where other foods lack in nutrition. That's nutritional balance in a nutshell. Just because a food is Low-Cal doesn't mean it's not going to make you look fat. Konjac soaks up fluids in your stomach expanding pushing against the inner walls of your stomach outward, which is why it has been long considered that eating too konjac may make your stomach bigger. A rule of thumb is to stick to 300g servings per day. Eating too much fiber in your diet may lead to diarrhea. That is exactly why you should stay away from eating too much konjac. Although there are an endless number of ways to use konjac in cooking, eating it every day may lead to getting tired of your Konyaku Diet faster than you expect. Figure out a way to make the fact that konjac in your food be the seamlessly chewy part of your meal. That is to mix it up trying out anything and everything Konyaku. Here are some Shirataki Noodle recipes to get you started on the right track to making your konjac diet work out as planned. Do you know Shiratakis Calorie? Eating mung beans sprouts help you diet for weight loss. Not only are can you add Moyashi-sprouts to your list of source of vitamin B2, they contain isoflavone. That last thing you want to here after deciding to eat bananas on a diet is that weight loss plans like the morning banana diet. Despite what others may say there’s got to be something good about bananas. Making controlling the calories you put in your body just that much easier by simply eating Konyaku in your daily meals for best results. Konjac contains essential dietary fiber such as Konyaku glucomannan your body needs to flush out the bad from your body. 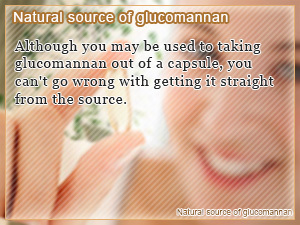 Although you may be used to taking glucomannan out of a capsule, you can't go wrong with getting it straight from the source.